Valentine’s Day is this Sunday! 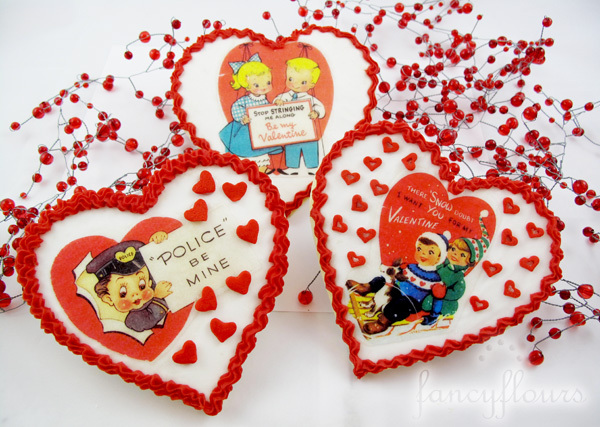 Darling Retro Valentine Postcard Cookies will make your sweetie smile! I love the quotes on these postcards, from “Police be Mine” to “Stop stringing me along. Happy Valentine’s Day.” Not only will your cookies be a hit, but everyone will get a chuckle out of them too! We used the Retro Valentine’s Wafer Paper set, Rectangular Cookie Cutter, Heart Cookie Cutter, Jumbo Heart Quins and White Edible Glitter to create this darling little cookies. Don’t forget to try the Fancy Flours No Fail Sugar Cookie Recipe. Once you try it you will never go back! The cookies don’t spread and turn into big blobs once you bake them, and the finished product is absolutely wonderful – true, buttery, sugary cookies! For a complete recipe of these cookies, click HERE. In a hurry for Valentine’s treat ideas – check out our How-To Recipes and Ideas page for several delightful Valentine’s treat ideas. Need product fast? Order now and use our 2 day shipping method – for only $15.00! Many Valentine wishes to you, fancy friends! This entry was posted in Cookie Recipes & Ideas, Valentine's Day Baking and tagged Cookie Recipes & Ideas, fancyflours, sugar cookies, valentine, wafer paper by Fancy Flours. Bookmark the permalink.